Because everything eventually becomes an academic field (I’m still waiting for “Internet” to become a major), researchers from MIT, University of Southampton and Georgia Institute of Technology have teamed up to build Who Gives A Tweet, a Twitter app that allows users to anonymously rate their friends’ and strangers’ tweets in order gain more insight into status update perception. Kind of like Hot Or Not, but for tweets. 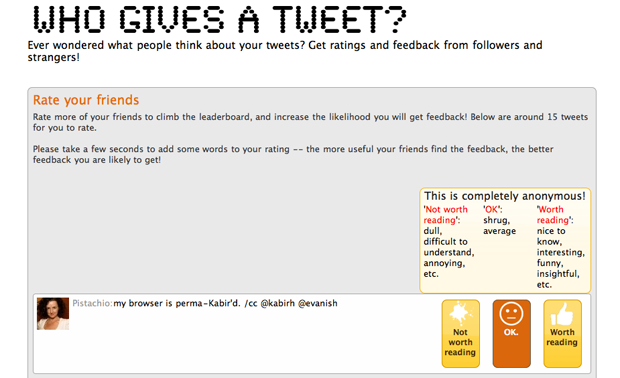 Aside from serving up feedback from your friends, the app also gives you tweet feedback from strangers via Amazon’s Mechanical Turk. Thus far I have been rated by two people on my “Caveat: I have absolutely no interest in anything that combines New Year’s resolutions and social media” tweet from yesterday. While one person found it “Sort of funny” another said “This person has no interest in New year’s resolutions and social media, and I have no interest in this tweet.” Ouch. You can find Who Gives A Tweet in the Twitter app store here.